Thank you for your order. We’ll let you know once your item(s) have dispatched.You can check the status of your order or make changes to it by visiting Your Orders on Amazon.co.uk. Order details and invoice in attached file. Need to make changes to your order? Visit our Help page for more information and video guides. 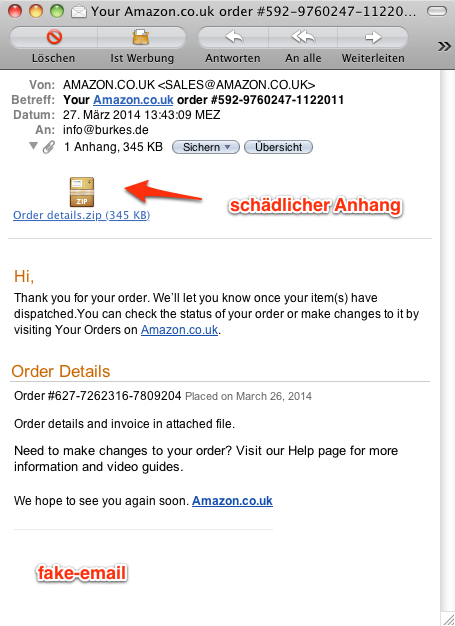 Die email ist besonders verführerisch, wenn man in letzter Zeit tatsächlich etwas bei amazon bestellt hat.